More than 350 teams and 3,000 employees took part in the first Porsche 6-hour run through the plant in Zuffenhausen. The runners’ target was to finish as many laps of the 911-metre circuit as possible because every complete lap was worth five euros to Porsche AG in aid of charitable causes. Efforts invested by the employees as well as members of the Executive Board and works council have certainly paid off. After an impressive 29,463 laps, the Olgäle Foundation, the Children and Adolescents’ Hospice in Stuttgart and the association “Frühstück für Kinder” [Breakfast for Children] – for the support of refugee children – received a total of 175,000 euros, after the Executive Board had additionally rounded up the total. 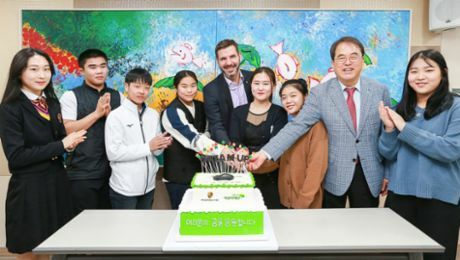 Porsche Korea has held a scholarship ceremony with ChildFund Korea for the campaign ‘Porsche Dream Up’. The principle of keeping perfect time applies not only to music, but also to automotive engineering. An update on the 24th Leipzig Opera Ball – Porsche announced that it will host the ball again next year.